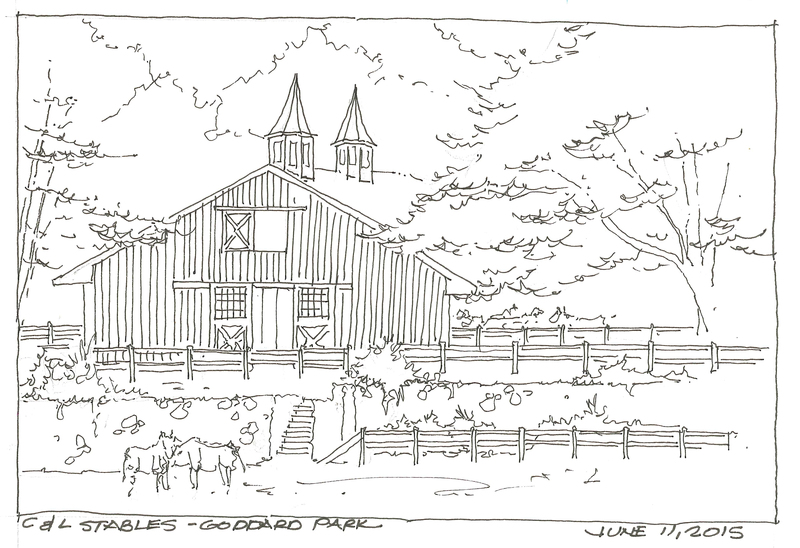 After a wonderful evening gathering with co-workers in Warwick, Rhode Island and as the sun was setting on a beautiful day, I stopped into Goddard Park for my daily sketch. The C & L Stables is a wonderful location within the park and very picturesque with the stables, horses, barn and sunken stone lined stable as shown in the foreground. and Goddard Park’s 489.2 acres in Warwick has had a colorful history down through the years. As a private estate, Goddard Park was richly endowed with spacious lawns, fields, and forested areas. This wealthy inheritance of the State still largely remains in spite of the extensive damage caused by the 1938 hurricane. Located along two miles of Greenwich Cove, the park was formally opened to the public on June 1, 1930. Faber-Castell Pitt extra fine black art pen in my Stillman and Birn Sketchbook. beautiful drawing! the building is really well executed!